Seminal wuxia film, slicker than your average and bubbling with a colourful elan, although contrary to popular belief this is not quite the best martial arts film ever made. To western eyes, the stalwart knight lady at the heart of the film appears more radical now than it did back in 1960s Hong Kong, a place already familiar with strong female protagonists from traditional Beijing Opera stories to wuxia novels and movies. Cheng Pei-pei, aged 19, commands the role of the lethal Golden Swallow with enough intensity to put an absent Bruce Lee in his place. Widely regarded as director Hu’s greatest collaboration with Shaw Brothers (and his bloodiest), his excellence in staging and photography outshine most of the action scenes which clash and fumble into one another with all the fluidity of a car crash. The story is equally incoherent. Ching rebels kidnap a Chinese official in return for their leader’s freedom, only to face the gender-bending Swallow in their wake. But lots of fun is had, particularly via the loveable Yueh Hua who plays the Drunken Cat, an Opera trained upstart who steals Pei-pei’s thunder with the mastery of a powerful hand technique which allows him to eject dry ice into the faces of his opponents. This film is commonly referred to as the first of King Hu’s ‘inn trilogy’, due to his patented device of using a single set as a microcosm of character, intrigue and action. 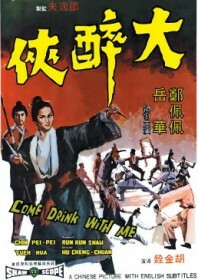 The other films in Hu’s ‘inn trilogy’ include Dragon Gate Inn in 1967, followed by The Fate of Lee Khan in 1973.